A Russian passenger Metrojet Airbus A321 plane has crashed in Egypt’s Sinai Peninsula, on Saturday 10/31/2015 at about 05:51, 23 minutes after takeoff from the Sharm el-Sheikh heading to St Petersburg . Egypt’s civil aviation ministry said the wreckage of the Russian passenger jet was found in the Hassana area, south of the city of el-Arish, an area with intensive Jihadi terror activity of the Sinai Province branch of the Islamic State . .All 224 passengers and crew killed . The Airbus 321 was at an altitude of 9,450m when it vanished from radar screens. The flight recorder which contains the flight data was found at the scene. An Egyptian security officer at the scene said: “A lot of the dead are on the ground, and many died whilst strapped to their seats. I now see a tragic scene. “The plane split into two, a small part on the tail end that burned and a larger part that crashed into a rock. We have extracted at least 100 bodies, and the rest are still inside” he said. The Russian Cairo embassy confirmed there were no survivors. On Saturday afternoon, jihadis allied to the so-called Islamic State made a claim on social media that they brought down flight KGL9268 “in response to Russian airstrikes that killed hundreds of Muslims on Syrian land”. An Youtube footage posted on the web allegedly showing the Airbus exploding in the air and unwinds apart was removed soon after. The Egyptian authorities denied that the cause of the crash was a terror attack . Germany’s Lufthansa and Air France said they would halt flights over Sinai until the reasons behind the crash became clear. ** The Russian airliner which crashed in Egypt’s Sinai peninsula, killing all 224 people on board, broke up in mid-air, a Russian official said on Sunday 11/01/2015..
.** Kremlin’s spokesman Dmitry Peskov said, on Monday 11/02/2015, that there are not yet any grounds to rule out any theory for the crash of the Russian airliner in Egypt, including terrorism. The airline’s deputy director, Viktor Yung, said that the plane must have been damaged by an external force, as it could not have spontaneously broken . The most reasonable assumption at this stage is that a bomb was smuggled, somehow, into the aircraft (see also – Russian double airliners explosions ) . 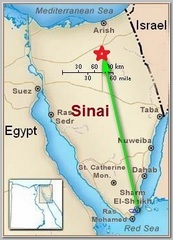 ** A US infrared satellite has reportedly detected a heat flash at the time a Russian passenger jet went down in Egypt’s Sinai Peninsula, a US official has said on Tuesday 11/03/2015, as the investigation into the deadly plane crash continues. ** The Russian plane that crashed in Egypt at the weekend “may well have been brought down by an explosive device”, Downing Street has said on Wednesday 11/04/2015. USA intelligence also suggested that the crash of Metrojet Flight 9268 was most likely caused by a bomb on the plane planted by ISIS or an ISIS affiliate, according to a U.S. official familiar with the matter. ** UK investigators looking at what caused a Russian airliner to crash in Egypt believe a bomb was put in the hold prior to takeoff, the BBC has learned, on Thursday 11/05/2015. It had also received intelligence based on intercepted communications between militants in the Sinai Peninsula before and after the airliner crash. ** Russia’s security chief Alexander Bortnikov said, on Tuesday 11/17/2015, an act of terror brought down the Russian A321 airliner in Egypt last month “Traces of foreign explosives” were found on debris from the Airbus plane, FSB chief told Russian President Vladimir Putin. Mr Bortnikov said a bomb had been planted on board the Kogalymavia jet, equivalent to up to 1kg of TNT. Two Sharm el-Sheikh airport employees were arrested for planting the bomb in the aircraft . Islamic State’s official magazine Dabiq carried a photo, on Wednesday 11/17/2015,of a Schweppes soft drink can it said was used to make an improvised bomb that brought down the Russian airliner The photo showed a can of Schweppes Gold soft drink and what appeared to be a detonator and switch on a blue background, three simple components that if genuine are likely to cause concern for airline safety officials worldwide. ** An EgyptAir mechanic whose cousin joined Islamic State in Syria is suspected of planting a bomb on a Russian passenger plane that was blown out of Egypt’s skies according to Russian sources familiar with the matter on 01/29/2016.